Musical influences: Beethoven, Bach, Mozart, Vivaldi, Schumann, etc. Key teaching concepts: Focusing on each student’s individual interests, building a solid foundation on traditional music and theory while incorporating style and preference. Judy Cruces is a welcome addition to the talented and professional team of instructors at Music Time Academy. Since she first began teaching private lessons several years ago as a college Music student in pursuit of a Bachelor’s Degree, Judy’s positive, professional and patient teaching style has since built up a vast, loyal base of students of all ages on a variety of instruments. Judy has a fantastic track record for working with some of our youngest voice, piano and violin students, as well as some of our most advanced, older students. Many of her past and current students have reached first chair in school Orchestra and been awarded various honors for their musical achievements under her guidance and encouragement. 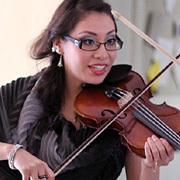 Not only does Judy hold a Bachelor’s Degree in Violin Studies from the highly regarded Music Department at California State University, East Bay, she has also studied with Josh Cohen (Castro Valley Chamber Orchestra) and Philip Santos (Chicago Symphony, San Francisco Symphony, Oakland East Bay Symphony). Her studies in music are complimented by experience with performing in a variety of formats and ensembles (everything from orchestras to heavy metal bands!) as both a vocalist and instrumentalist. Currently, Judy performs in a duo alongside guitarist (and fellow Music Time Academy instructor) Michael Solomon. Their group, Cuerdas Azul, specializes in Latin/Jazz arrangements of traditional Spanish music, and can be seen at weddings, parties, and other local events. Judy can teach music lessons in both English and Spanish.